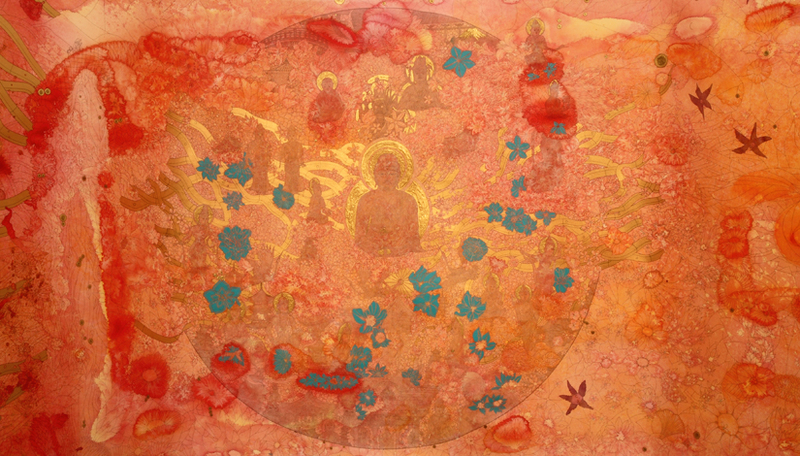 Mizuma Action (Nakameguro) will hold MARUTA Sai’s exhibition “Peace and Waves” from July 14th, 2010. A painter born in the city of Sasebo, Nagasaki prefecture in 1969, this exhibition is Maruta Sai’s first solo show in Tokyo. Among his use of acrylic and oil paint on paper or canvas, the artist’s expression through his use of the pen is a major element in his works. More than half of the realization time is spent ‘hitting’ more than ‘drawing’ the surface with a German made 0.1mm Rotring pen used for industrial drawings. The countless dots constitute the mysterious world of Maruta, changing slightly depending on the position of the viewer, then becoming an unique overwhelming universe when seen from a distance. The origin of the exhibition’s title ‘Peace and Waves’ is to be found at that micro level of the artist’s expression. Maruta spent one year hitting dots 10 hours a day as a prayer for Peace, eventually completing this time exhibition’s 10 meter-long spectacular work. Maruta’s almost ten years old strain at his Rotring technique reveals the artist’s strong interest for Leonardo Da Vinci who is said to have adopted a similar use of dots. According to the artist, the act of ‘hitting’ beginning like the morning prayers differs from the pleasant fact of ‘drawing’, rather leading to the world of an ascetic monk chanting a million prayers to the Buddha. Maruta who used to live in Tokyo says that he found what his self what longing for when he moved back to Nagasaki, exhausted by his life in the capital. There was the thicket of the mountain grass and the smell of the seashore he enjoyed as a child. His pathetic affection toward his native Nagasaki reduced to a burnt-out area by the dropping of the atomic bomb faces his nostalgia for the past and his hope for the future, his prayers or Love and Peace, proved to be the incentive to producing his work. The central piece of this exhibition ― the ten-meter-wide　‘World Peace’ ― depicts the beasts of the land and of the sea, the memories and legends of wars lurking in historical streets and buildings from all time and all places, buddhas, temples and shrines, a majestic mythological universe reflecting the artist’s imagination. This work is like made of the artist’s prayers for Peace, each dot holding one of them. Maruta hopes to share the intensity of his feeling through his work, praying for the advent of a true era of Peace yet to come. We must not forget the war and the atomic bombings of Nagasaki and Hiroshima that happened more than 65 years ago. We want this exhibition to be an occasion to look back at War and Peace in our society where information and time always flow more rapidly.